To prepare students for the careers of today -- and tomorrow -- we must up our game when it comes to understanding how to explore and integrate artificial intelligence (AI) in K-12 education. AI should be a critical element of any STEM curriculum. After all, it’s a technology that’s already making its way to classrooms in the form of adaptive software, recommendation engines and digital assistants. Educators are the link to preparing students to thrive in a world where artificial intelligence is an integral part of their life and career. Nearly 1,000 educators are participating in professional learning programs developed by ISTE that equips them to help students develop knowledge and skills about AI, including considering the capabilities, risks, and ethical questions related to using AI exploring solutions to problems in their communities. "This has been one of the best courses, I have completed. I teach a lot of graduate level technology courses including some basic coding but none really have expanded my own learning like this one. When I finish, I am going to go through it all again, just to make sure that I am able to take it all in and practice like I want to. Then, I will use some of the ideas with my own students this summer." ISTE has developed new resources on artificial intelligence (AI) in K-12 education - jump in and get started. Artificial Intelligence Explorations and Their Practical Use in Schools © unpacks everything educators need to know about bringing AI to the classroom. Sign up for the next course and gain graduate-level credit for your learning. The new ISTE book Teaching AI: Exploring New Frontiers for Learning explores what AI is, how it works and how educators can use it to better prepare students for a world with increased human-computer interaction. ISTE 19: Artificial Intelligence in Philly! Learn more about AI at the ISTE Conference & Expo and view the sample schedule of sessions related to artificial intelligence in education. You have probably heard of Amazon Alexa, but that is just a small example of how AI technologies power commerce and creation at Amazon. View this webinar to explore innovative AI applications in action, learn how diverse project teams come together to make the AI magic happen, and learn how your school can benefit from free and exciting opportunities through the Amazon Future Engineer program! 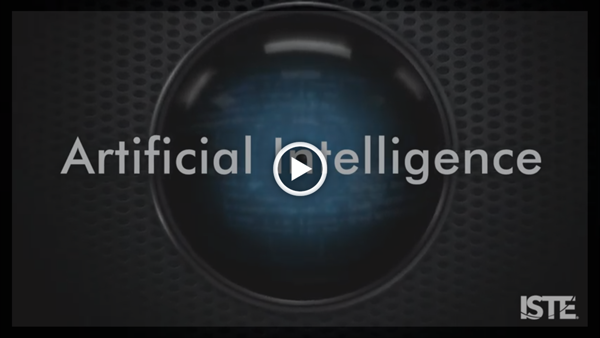 Artificial Intelligence is not just changing the technical world. In fact, at IBM Research - Zurich, AI and machine learning are changing the way people look at the material world! In this webinar, the IBM team will present an Artificial Intelligence (AI) model to predict organic chemistry reactions. Six high school girls create two separate organizations - Allgirlithm and CreAIte - to bring AI experiences to high school students across the country. TOOLBOX: Action! - educator recommended! Pixar in a box allows students to experiment with technology being used in the film industry. FRAMEWORK: Find the source - educator recommended! TensorFlow is a open source machine learning framework. LESSON PLAN: Find a path - educator recommended! Microsoft Education offers STEM lessons written by teachers, for teachers.